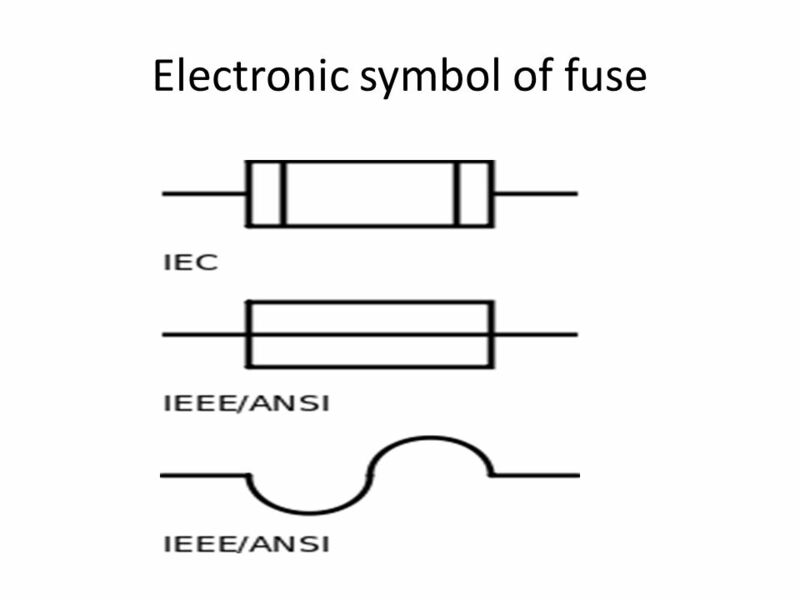 Fuses are the oldest and easiest-to-understand circuit-protection components, with several common schematic representations, Figure 1. The function of the fuse is simple and clear: in the case of an overcurrent condition, the fuse “opens” (or blows, in common parlance) which thus stops the flow of current. Despite their simplicity, fuses have subtleties and considerations which designers should be acknowledged when they choose a fuse (or fuses) for their system. This FAQ will look at fuse basics and specifications for a variety of situations. Q: What the operating principle and “action” of the fuse? A: It is very direct: the current flows through an internal wire or mass, also called a fusible link, Figure 2, which is housed in a glass or ceramic enclosure. Due to a combination of its thickness, thermal mass, and materials (tin, lead, bismuth, aluminum, and others), this link is designed to melt at a specific temperature. The heat for melting is generated by the inherent I2R power loss as the current passes through the link and its resistance. Once the link melts, the circuit is broken and current flow ceases. This current can be AC or DC, as it is the RMS value of the current that produces the equivalent heating power. 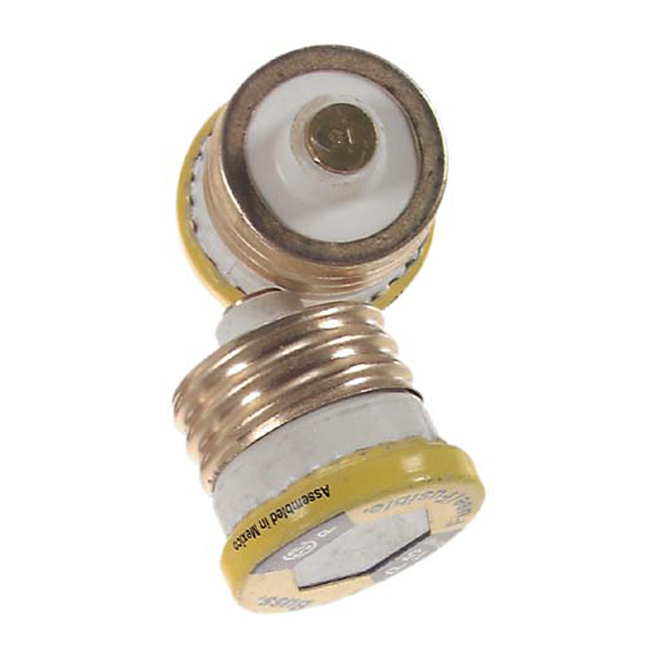 Q: Where are fuses used? A: They are used anywhere there is a need to protect a system input or output from risks and consequences due to excessive current flow. For example, a fuse can protect a power rail (AC or DC) which is feeding a power supply from supplying excessive current and perhaps shutting down, if that connected supply has an internal short. Conversely, a fuse can protect a power supply from damage if its output load is shorted. It’s not usual to have multiple fuses in a power subsystem, as well as fuses protecting individual local circuits, sensors, and loads. Fuses are not just for “power” circuits: a low-current fuse (a few hundred mA) can protect against damage due to a misconnection of a plug and socket. Q: What is the key operating aspect of the fuse? A: Once a fuse “blows”, it cannot be reset but must be manually replaced. This is both a virtue or a nuisance, depending on the application. It means the source of the fault must be located and fixed, but it also means that manual intervention (and sometimes disassembly) is needed to get the equipment back in operation. One alternative to the fuse is the circuit breaker, which uses electromagnetic and thermal principles to provide fuse-like action. Both self-resetting and manual-reset circuit breakers are available; again, the choice is a function of the application. In general, circuit breakers are larger, heavier, and more-costly than fuses. Q: What’s the relative cost of a fuse? A: One of the attractions of the fuse is that they are fairly inexpensive, even if the cost of the fuse-holder clips or socket is included. A basic, low-current fuse can be just a few cents. 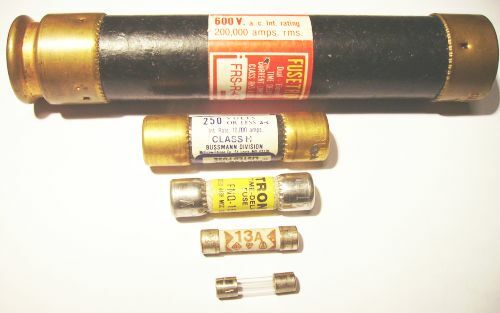 Q: How are fuses “sized”? A: The first parameter is the current at which the fuse blows open. This can range from under an amp to hundreds of amps. Higher-current fuses are larger because their fusible links are larger and have greater thermal mass. The second parameter is the voltage rating of the fuse. Although fuse activation is entirely a function of the current through the fuse, and not the circuit voltage, the voltage is a concern because of distance between fuse contact points, internal arcing, creepage and clearance mandates, and more. 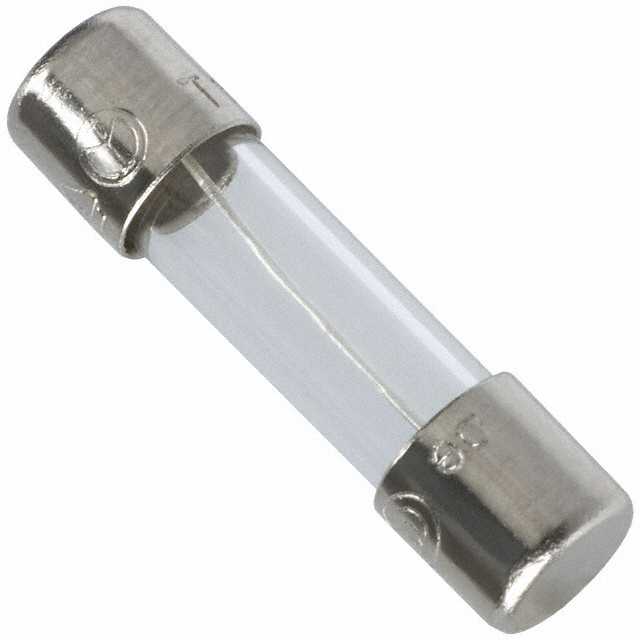 In fact, fuses for higher curtents – on the order of hundreds of amps – are sometimes filled with sand or inert liquid to prevent internal arcing. Q: Are current and voltage all that characterize a fuse? A: No! As with all apparently simple components, there are many first-, second-, and third-tier parameters. 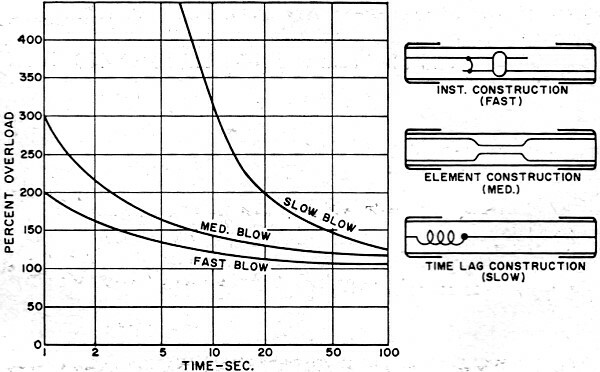 For fuses, a key defining specification is a current versus thermal profile, Figure 3, which is different for every fuse type. Q: Does a blown fuse cut the current to zero? A: Not necessarily, although that is a commonly assumption. When the fusible link opens, minute metallic particles may still “float” in the fuse body and may even coat the inside of the fuse body. These can provide a very current path, although of very high resistance, which still allows the current to flow but at an acceptably low value. The industry has specifications for the maximum allowable resistance as a function of fuse rating; a typical value would be 50 milliohms for a larger fuse. Q: What body type/form factor are available for fuses? A: Fuse-body size is a function of current and voltage rating, of course. However, even at a given current ratings, there are many standardized fuse-body options. For example, there are blade-type 15-A and 20-A fuses (Figure 4) commonly used for car circuits (12 VDC), low-current “3AG” fuses for up to about 120 VAC (Figure 5), and older screw-in fuses (often, “S” and “T” type) rated to 20 and 30 A used in 120 VAC power lines (Figure 6); larger fuses (50 A and higher) are often housed in cylinders called cartridges (Figure 7). There are also tiny, low-voltage fuses slightly larger than a match head, and with wire leads, which can be inserted in a PCB board, and even tiny surface-mount fuses. Part 2 of this FAQ will look at operating parameters and specifications of fuses in more detail.